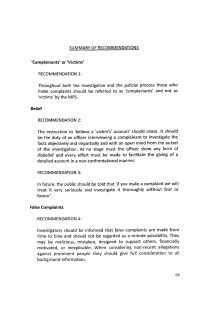 The Metropolitan Police Service has today, Tuesday, 8 November published the key findings and recommendations from the independent review into the investigation of non-recent sexual offence allegations against public figures. That review was carried out by former High Court Judge, Sir Richard Henriques. He examined eight investigations, including cases from Operation Yewtree; Operation Midland and Operation Vincente. The report contains 25 recommendations, that are relevant to law makers and policing nationally, it also highlighted a number of ‘significant failings’ in Operation Midland. “I asked for this independent review because I wanted to know if mistakes had been made in Operation Midland and other investigations into prominent persons so that the Metropolitan Police Service (MPS) could learn any lessons. “Over eight months, Sir Richard has been able to examine these cases in detail, and the MPS is publishing his findings today. 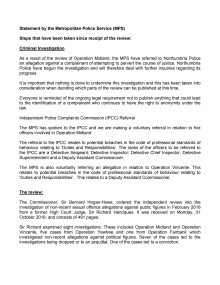 “His review articulates serious failings in the conduct of Operation Midland, an investigation into allegations of historic sexual abuse, and Operation Vincente, the unrelated investigation into an allegation of sexual assault by Lord Brittan. “It also highlights the impressive and dedicated work in Operation Yewtree and Operation Fairbank. 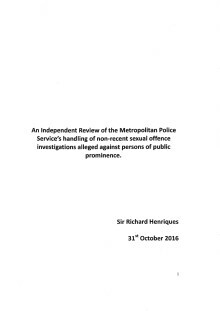 “In his letter accompanying the report, Sir Richard Henriques, a former High Court Judge, says the failings of a few officers should not undermine the reputation of the Metropolitan Police Service as a whole. “Not to have closed the investigation sooner. “I accept on behalf of the Metropolitan Police accountability for these failures as I accept accountability for failures in any of our operations and investigations. “It is a matter of professional and personal dismay that the suspects in the investigation were pursued for so long when it could have been concluded much earlier. “I am today issuing a public apology to Lord Bramall, Lady Brittan and Harvey Proctor for the intrusion into their homes and the impact of Operation Midland on their lives.The public identification of suspects compounded the harm of our investigative failures. “They have all suffered as a result of the investigation and our description of the allegations as ‘credible and true’. We should not have said this, and we should have tested the credibility of the complainant more rigorously before conducting the searches. “I fully recognise that Mr Proctor, Lord Brittan and Lord Bramall are innocent of the offences of which they were accused of by the Operation Midland complainant. That investigation found no credible evidence against any of the suspects. “Sir Richard also concludes that there were significant failings in respect of the way in which Operation Vincente was handled. 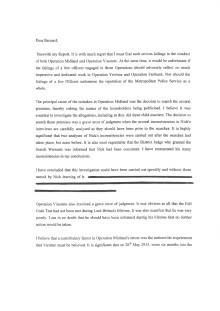 “I accept that the correct decision was made by Detective Chief Inspector Paul Settle in concluding that no further action should be taken in the case, although I can understand why the case was reopened and note that Sir Richard describes the decision as not wholly unreasonable. “However, once the investigation had been reopened, Lord Brittan should nevertheless have been told before he died that the CPS full code test had not been met and that there was no intention to prosecute him in the case. Again, for these failings I have offered Lady Brittan an unreserved apology. “I have already conveyed my sincere apologies to Lord Bramall in person and have offered to meet Lady Brittan and Harvey Proctor for the same reason. “Under my leadership, I have been clear that the Metropolitan Police should apologise when it get things wrong. “In these cases, I believe it is right to offer a personal meeting because the damage caused was amplified due to the public profile of the suspects. “These investigations – and those in Operation Yewtree many of which led to convictions – started at a time when there was significant concern that numerous sexual attacks on children and others had been ignored, including by the Metropolitan Police in decades gone by. “Even worse were the allegations that abuse had been covered up by the establishment, including the government. “It was in the context of the creation of an independent inquiry, together with parliamentary and media scrutiny that officers made their judgment. “I cannot, and do not expect the sympathy of the suspects in these cases. But I do believe that it is necessary to understand the pressure on the investigators at this time. This entry was posted in Uncategorized on January 14, 2017 by richardwsymonds37.